Voodoo Lab was the first mainstream company to provide high-quality isolated power supplies for pedals, and the Pedal Power 2 has become the go-to device. 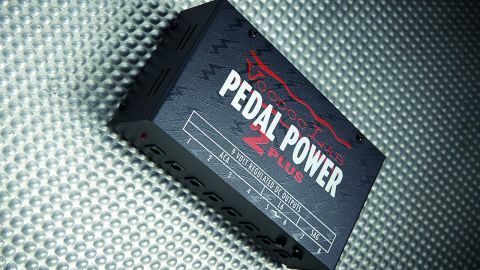 The latest version, the Pedal Power 2 Plus, has plenty of juice for a medium-sized pedalboard, and some useful features not found elsewhere - such as a 'sag' knob on two of the outlets, for turning down the juice to simulate a low battery - useful for transistor-based fuzz circuits. There's also an IEC output socket for adding another unit or a mains-powered pedal.